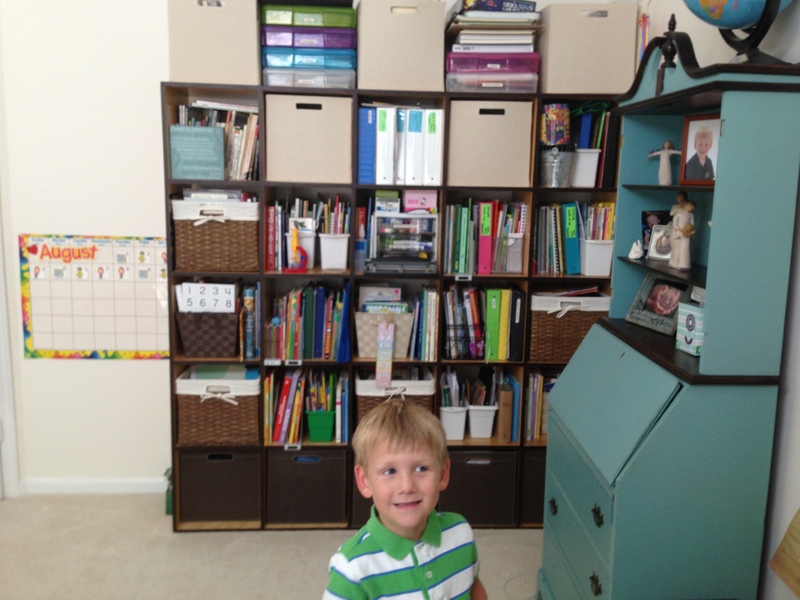 For those who might care… and I know some other homeschool moms just NEED to know, here is how I organized my big bookshelf/bin unit. I know this is not a great picture, but you can kind of see how it works. All the baskets and bins are from Target. My husband and I made the shelf unit a couple years ago to use for scrapbooks and toys so it is custom fit to the bins I chose. But basically it’s a custom made version of the Ikea 5×5 shelf unit that is 6’x6′. Upper row: Scrapbooking supplies and art stuff (hopefully will move at some point). Art related books: Kids art projects, Books on Artists, How to draw… etc. I use this for my daily supplies, books and binders, so it comes down daily. School supplies (folders, binders, laminating sheets), guides for next year, guides I may want to use later this year. Skylar’s Math and Science add-ons. Books we won’t use daily, but regularly. Skylar’s teacher guides: Rod & Staff 3 teacher guide, DITHOR teacher guide, AAS 3 guide, etc. Skylar’s texts & guides for later in the year (3B math, writing guides, science guides, etc. Circle time books for: logic, art, music, fairy tales, nursery rhymes & devotions. Also white boards and calendar time resources. Devin’s math workbooks, & mazes (in binders in page protectors so he can do over & over), books about math, sequencing pocket chart. Devin’s teacher guides: for Little Hearts, Phonics Museum K, History, etc. I cannot tell you how many hours I spent getting this the way it is now, but I like the end result! And I can find things easily and quickly now, which is really the fruit of my labor.